This demo was released in the year 2000, and it is back again in another disguise, another reissue by MTD Production. And I am glad they did, "Mystery Babylon" is a good demo indeed. Being primitive and redundant not always spell disaster, let's not forget the most important factor is the way you harness it. And such is the case with ASTAROTH. While there's no denying that they do nothing but repeating what has been already established, "Mystery Babylon" is nothing short from a devoted early BURZUM worshipping. In fact this is one of the most BURZUM-esque local release I have ever heard. Chords are being dragged and repeated for that hypnotizing allure. 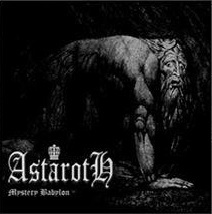 As listening to it requires a meditative-like concentration for the full effect, ASTAROTH is gracious enough to add bits here and there every once in a while just for that miniscule variations, just enough to held the listening on their long compositions (7 minutes are the shortest they could get). The band is active again apparently, thus we should expect something that hopefully can even better this, which is already worth mentioning.